With ISIS carrying out rampages through archaeologically sensitive areas of Iraq, a pertinent question to ask now is what group’s cultural heritage in the Middle East is being preserved, and whose is being destroyed. 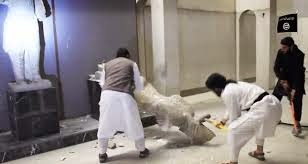 Over the past couple of weeks shocking reports have surfaced concerning mass destruction of Iraq’s cultural heritage at two locations–the museum in Mosul and the ancient Assyrian city of Nimrud, located in northern Iraq. Both incidents were perpetrated by the so-called Islamic State. The one at the Mosul museum was recorded on video. But destruction with sledge hammers, bonfires, and heavy equipment isn’t the only threat to priceless objects thousands of years old. Artifacts are also being illegally excavated and pilfered on a massive scale. An enormous black market in stolen antiquities in fact has arisen in the last four years since the outbreak of the conflict in Syria, and the general rule of thumb seems to be if it’s small enough to be carted off, take it and sell it on the black market; if it’s too large to move, then smash it to pieces. This is what we’ve seen repeatedly in Syria and Iraq since ISIS took over large swaths of both countries. By the way, the trade in looted antiquities seems to be quite lucrative, with some of these items fetching in the hundreds of thousands of dollars, while the total black market trade has been estimated at roughly $7 billion per year. This is not just Iraq’s cultural heritage that is at stake, of course; it’s all of humanity’s. If we think of human history collectively as a lepidopteron, drifting lazily from the flower of the Neolithic past, into the age of proto-writing, and finally early recorded history, then Syria, Iraq and the Fertile Crescent stand out perhaps unique among regions of the earth. This is where human civilization got started, and the looting and destruction of these antiquities is a loss to all of us. Interestingly, an exhibition entitled “By the Rivers of Babylon” has now opened at a museum in Israel, and among its exhibits are a large number of ancient Babylonian cuneiform tablets–110 of them altogether. These tablets belong to a London-based Israeli collector by the name of David Sofer, but a controversy has sprung up, since there seems to be some question about the provenance, or origin, of the artifacts. The tablets are said to be some 2,500 years old and reportedly shed light on the biblical Israelites during their exile in Babylon (in what is, of course, today Iraq). Sofer claims he purchased the tablets in the 1990s from a person who supposedly obtained them through public auction some 20 years previous. However, he reportedly has refused to name the person he bought them from. The rise of ISIS has made it extremely perilous for archaeologists to continue to work in Iraq and Syria, and most expeditions have in fact come to a halt. But in Israel these days things are a bit different. Unhindered by ISIS marauders, the Israeli Antiquities Authority has undertaken archaeological excavations in numerous areas of the country, including one begun last year in the occupied West Bank, where the objective is to recover artifacts dating back to the King David era. Finds of this nature would, by some views at any rate, help validate Israel’s “3000-year-old land claim,” as it’s been called, and thus you won’t be surprised to learn that this isn’t the only such archaeological dig going on–not by a long shot. In fact, you can go to the website of the Israeli Antiquities Authority, where no less than 19 separate excavations are listed as currently active for the year 2015. So what to make of it all? That’s a good question. All I can really say is that it seems enormous efforts are being expended to recover and safeguard Jewish cultural heritage–this, ironically, as everyone else’s cultural heritage in the Middle East is being looted and destroyed. At any rate, here is an article recently published about the museum exhibition in Israel featuring the artifacts in Sofer’s possession. A new exhibition in Jerusalem is causing heated debate. The exhibition, ‘By The Rivers of Babylon’, at the Bible Lands Museum, displays some spectacular examples of ancient Babylonian tablets. On show for the first time, the 2,500-year-old clay tablets written in cuneiform present artefacts from an important time in the Middle East. Experts note that the collection of 110 clay tablets provides the earliest written evidence of the Biblical exile of the Judeans in the area of modern-day Iraq. As such, the Babylonian tablets provide fresh insight into a formative period of early Judaism. Filip Vukosavovic, a curator for the exhibition, says the tablets complete a 2,500-year puzzle. Many Judeans returned to Jerusalem after the Babylonians allowed them to in 539 BCE, but some remained in the area to build a Jewish community that lasted for two millennia. “The descendants of those Jews only returned to Israel in the 1950s,” Vukosavovic said. As a result, the tablets provide a unique insight into a little known period of Jewish history. Controversy has surrounded the exhibition however, as the tablets are the product of a modern, shadowy process. The recently chaotic climate in Iraq and Syria has led to the rampant theft of the area’s archaeological heritage. Widespread looting has led to the international antiquities markets being stocked with cuneiform tablets. Many museums have promised not to exhibit artefacts that may have been looted, as part of an effort to discourage the illicit trade in antiquities. Cuneiform inscriptions, however, are a notable exception to this. Since 2004, cuneiform artefacts with no record of where or how they were unearthed have been allowed to be transported, in order to be examined by scholars. This is done on the condition that Iraqi authorities give their consent, and that the tablets are eventually returned to Iraq. Some argue that these precious objects, some of which are the earliest examples of writing in the world, could be forever lost if they are not looked after by conservators. It has been claimed that the Islamic State extremist group and other militants are part-funding their campaigns through the illegal trafficking of historic artefacts. Trafficking and looting have, however, been going on for a long time. Archaeologists were first alerted to the problem during the first Gulf War, when Western antiquities markets were flooded with cuneiform artefacts. London-based collector David Sofer, who owns the cuneiform collection currently exhibited in the Bible Lands Museum, has denied his artefacts were trafficked. He said he had bought the tablets legally in the United States in the 1990s; and the tablets had previously been obtained from public auctions in the 1970s. The exhibition at the Bible Lands Museum allows the public to see some remarkable artefacts and to learn more about an important part of Jewish history. What must not be overlooked, however, is the damage which can be caused by illicitly-obtained artefacts. “These things would be lost, and wouldn’t be recognized for what they are” if he hadn’t bought them, Sofer said. More on David Sofer (or someone from Israel going by the same name, at any rate) can be found here in an L.A. Times article from 1991. It seems he and a fellow Israeli, Nahum Vaskevitch, were implicated in insider trading in 1987. While the Sofer named in the article appears to have reached a settlement in his own case, Vaskevitch went on to be named in a 45-count indictment accusing him of conspiracy and violation of US insider trading laws from 1984-87. Two additional articles, both from 2008–one here in YNet and the another here in Haaretz–describe a controversy which arose over a Sofer-owned property, a highly prized piece of Jerusalem real estate known as the Villa Salameh. The rightful owners of this property were a Palestinian Christian, Constantine Salameh, and his family, who completed construction on the villa in 1935. But in 1948 the family left Israel and the property was seized by the new Israeli state under the so-called Absentee Property Law. The government of Belgium also entered the picture, leasing the property for its consulate in Jerusalem. But instead of paying rent to the Israelis, the Belgians made a decision apparently based upon conscience and sent their rent payments directly to the Salameh family, who by this time were living in Egypt. However, in 1983 Sofer (or, again, someone by that name) acquired the property for a faction of its worth and sued the Belgian government for full payment of rent. The case was decided in an Israeli court. Fortunately the Salameh family had some political clout and was able to negotiate a settlement awarding them $700,000 as compensation for their lost property–a small fraction of its total value. Quite an interesting story, to be sure, but what does it have to do with the theft of archaeological artifacts going on today? Maybe nothing. Maybe a lot. Back in May of 2003, after the fall of Baghdad and the looting of Iraq’s national museum, a large trove of Jewish communal documents, Torah fragments as well as public records dating back several centuries, were discovered in a flooded basement and taken to the United States for restoration and safeguarding. Iraqis were given assurances that the collection would be returned to them at a later date. Eventually the summer of 2014 was set as the target date for when the restored documents would be handed back over, but this got sidetracked in late 2013 when a campaign was launched to have the entire collection remain in the US…or possibly transferred to Israel. It is, after all, Jewish heritage, so the argument went, and since there aren’t many Jews left in Iraq today, why on earth should the collection go back there? Initially the position of US officials was that America would honor its commitment and return the collection to Iraq. But then in the summer of 2014, ISIS took over large parts of the country, including the city of Mosul, and in September it was announced that highlights of the archive, rather than going back to Iraq, would be taken upon a tour of US cities. 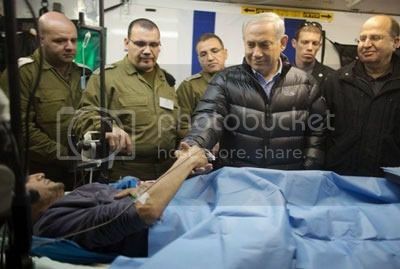 The plot thickened further in January of 2015 when it was reported that one of the artifacts, a 200-year-old Torah scroll, had not actually been taken to the US at all, but rather instead had been deposited at the Israeli Embassy in Jordan–and from there it made its way into Israel. Israeli Foreign Minister Avigdor Lieberman holds the Torah scroll that was spirited out of Iraq by US forces in May of 2003. Reportedly the scroll is now housed in a synagogue attached to the Israeli Foreign Ministry, and a ceremonial “Torah inauguration” is said to have been held on January 22. By all accounts the text of the scroll had been copied onto a deer skin parchment using concentrated pomegranate juice as ink. Supposedly the use of deer skin was unusual, as most of the Torah scrolls at the time in question were comprised of cow parchment. In any event, the disposition of the scroll, and its ending up in Israel, have prompted accusations of collaboration on the theft of Iraqi heritage by the US and Israel. Meanwhile, the rest of the Iraqi Jewish archive purportedly remains in “safe hands” in the US. Alas, the same cannot be said of Iraq’s, or humanity’s, “non-Jewish” heritage, as it were, the destruction of which continues at an alarming pace. The attacks upon the Mosul Museum and the ancient city of Nimrud, as well as the earlier ransacking and burning of documents at the Mosul library–these and other incidents like them exact a dreadful toll. They are, in essence, “taking us back to the dark ages,” as an Iraqi official recently described it. And it doesn’t seem to be letting up. Just within the past several days news has surfaced of destruction at two more sites, Khorsabad, located 12 miles northeast of Mosul, and Hatra, also in the general vicinity of Mosul though 68 miles to the southwest. Iraq’s Ministry of Tourism and Antiquities has confirmed reports of ISIS attacks at both sites, though the extent of the damage is unclear at this time. Deliberate destruction of cultural heritage by belligerent parties in war is of course not unprecedented. But clearly it is now being carried by ISIS to levels heretofore unseen. Protection of cultural property is covered under several international treaties, including the 1954 Hague Convention, though many critics are now saying that the laws are not tough enough and need to be strengthened considerably. With growing public outrage at the destruction now occurring in Iraq, chances are probably good we will see some toughening of international law on the matter. But the question is whether or not individual nations can muster the political will to adopt rigid enforcement of any new measures should they pass–and part of the problem in that regard seems to be complicity on the part of certain museums and auction houses, if not in the black market trade itself, at least insofar as knowingly accepting unprovenanced artifacts. As long as someone is making a profit or benefiting in some way, and as long as the geopolitical interests of certain powerful nations are served by continuing the conflict in the Middle East, the looting and destruction are not likely to let up anytime soon.